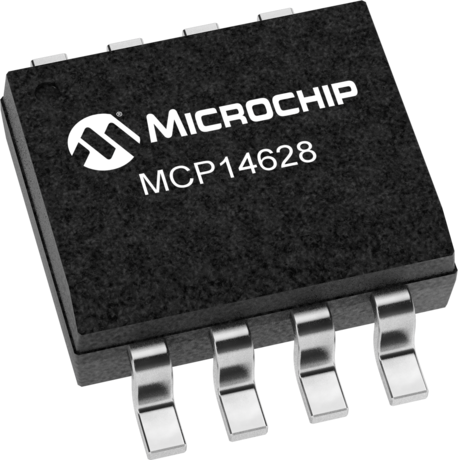 The MCP14628 is a synchronous MOSFET driver used for driving MOSFETs in a rectified bridge arrangement. This type of arrangement is typical of synchronous buck converter topologies.There are two separate drivers contained in the MCP14628. the low-side driver output drives a non-floating or ground reference N-Channel MOSFET. The high-side driver is designed to drive a floating N-Channel MOSFET. since the N-Channel is floating, this output needs to be able to handle the high voltages required to fully turn on the high-side MOSFET. An external bootstrap capacitor is used to provide the additional voltage. The MCP14628 is available in a surface mount 8 Lead SOIC package with a body width of 150 mils and the 8 Lead 3mmX3mm DFN package.